After the battle of Kinsale, the Irish Chieftains held a council of war, whereat it was decided that O'Neill should go to Ulster to defend the Northern province, O'Donnell to Spain, and O'Sullivan was to guard the interests of the South. 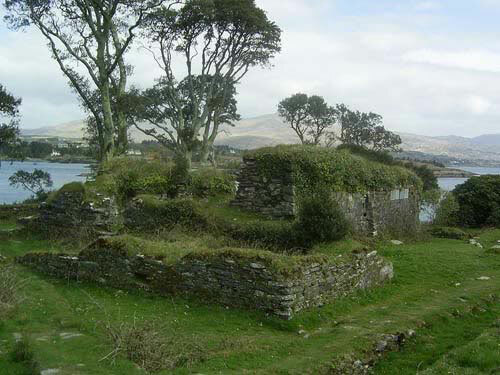 On the nth of January, 1602, Don Juan not only capitulated for the garrisons of Baltimore and Castlehaven, but also for Dunboy castle on the Beara peninsula. Captain Roger Harvey and Captain Flower had been commissioned on the 10th of January to take possession of those fortresses. Harvey was successful in taking possession of Baltimore and Castlehaven, but Flower failed to reach Dunboy by reason of foul weather and contrary winds. He lost fifty of the soldiers he had on board and all his crew, except seven, from some infection. O'Sullivan hastened to Dunboy and arrived safely, but he was refused admittance to his own castle. In the night, however, he mined his way into a weak spot of the castle which he well knew, bringing with him 84 men, among whom were the Jesuit, James Archer; Thomas Fitz-Maurice, Lord of Lixnaw; Donnell MacCarthy, Richard Tyrell, Captain William Burke, and Dominic Collins, a friar. A thousand brave soldiers were within gun-shot outside. At the dawn of day, Archer knocked at the door of Savadra, the officer in command, and requests his presence in " O'Sullivan's Chambers." He comes, and is informed that the Irish are in possession of the castle, that they would guard it for King Philip, that there was no use in resistance since they had a thousand men abroad within musket shot, whom they could call to their assistance if needed. Savadra was bewildered, and a few of his men discharged a shot or two, killing three Irishmen. The Spaniards were then disarmed, and sent to Baltimore, but some gunners, by request, remained behind; there was no compulsion in their regard. Don Juan de Aquilla, on hearing of the surprise of the castle, became enraged, and took it as an affront, and felt his honour compromised. He thought he was in honour bound to go back and retake the castle, and give it into the hands of her majesty. Mountjoy and Carew suggested that it was not his fault that the castle was surprised, that he need not trouble about it, for "they were desirous to see his heels towards Ireland." Donnell O'Sullivan Beare, writing to King Philip on February 20th, 1602, says:—"I came to their presence, tendering my obeysance to them, in the name of your majesty, and being with four hundred at my own cost, towards your service I yielded out of my mere love and good will without compulsion or composition, into their hands, in the name of your majesty, not only my castle and haven, called Bearehaven, but also my wife, my children, my country, lordships, and all my possessions, for ever to be disposed of at your pleasure.
" They received me in that manner, and promised (as from your highness) to keep and save the said castle and haven during the service of your grace. Notwithstanding, my gracious lord, conclusions of peace Was assuredly agreed upon, betwixt Don Juan de Aquila and the English, a fact pitiful, and (according to my judgment) against all right and human conscience. Among other places, whereof your greatness was dispossessed, in that manner which were neither yielded nor taken to the end they should be delivered to the English, Don Juan tied himself to deliver my castle and haven, the only key of my inheritance, whereupon the living of many thousand persons doth rest, that live some twenty leagues upon the sea coast, into the hands of my cruel cursed, misbelieving enemies, a thing, I fear, in respect of the execrableness, inhumanity, and ungratefulness of the fact, if it take effect, as it was plotted, that will give cause to other men, not to trust any Spaniard hereafter, with their bodies or goods upon those causes." O'Sullivan placed a garrison in Dunboy under Richard McGeoghegan, and placed three Spanish guns and sixty men on Dursey Island, where there was a fort built by his uncle Dermot. He had about 2,000 followers altogether under the command of Richard Tyrell. He captured during the winter his cousin's Castle of Cariganass. On the 9th of March, 1602, Carew despatched the Earl of Thomond to Bantry and Beare, and gave him some definite instructions. He was to leave no means untried to get Donnell O'Sullivan Beare into his hands. He was to give all the comfort he could to Owen O'Sullivan. " Have special care," he says, " to prosecute and plague the O'Crowleys who assisted Dermot Moyle MacCarthy. Sir Owen MacCarthy's sons, if they be well handled, will prove the best instruments of doing so, as he stands between them and the lord of the country." Mountjoy, writing to the English Council, says:—" As for Finan O'Driscoll, O'Donovan, and the two sons of Sir Owen MacCarthy, they and their fellows, since their coming in, are grown very odious to the rebels in these parts, and are so well divided in factions amongst themselves as they are fallen to preying and killing one another, which we conceive will much avail to the quieting of these parts." 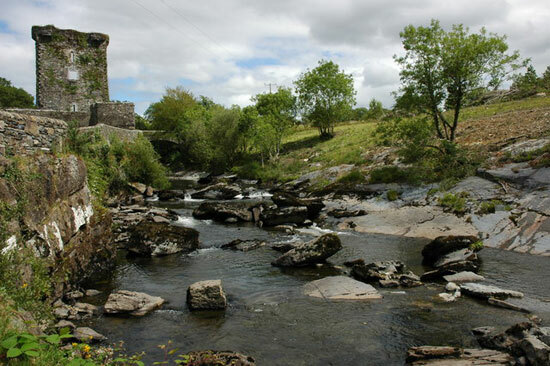 Thomond did his best to carry out the instructions, and marched as far as Bantry, where he learned that the Irish under Tyrell and O'Sullivan had occupied a strong position near Glengariff. The sons of Owen O'Sullivan and O'Donovan were at the time assisting the Earl,who, leaving a garrison of 700 men on Whiddy Island, thought it the wisest course to return immediately to Cork. Meanwhile, O'Sullivan was not idle. He cut off the Whiddy garrison from all outside aid, and harrassed them so that they had to abandon the island, and to set out for Cork. O'Sullivan, with his cousin Owen, pursued the retreating army and captured their baggage, and would have destroyed them had they not met Carew's army at the nick of time. Carew, recovering from a severe illness, and still feeble and weak, and acting contrary to the pressing advice of friends, who urged on him the hopelessness of the enterprise, representing that Dunboy Castle was impregnable, that there were no roads, no bridges, leading to it, that the country was rough and rocky, with many narrow passes where a few determined men could destroy a whole army, started from Cork on the 20th of April, 1602, with 3,000 men. On the 30th the army arrived at Dunamark, where stood a castle built some hundred years before by an ancestor of Sir George. Here the army remained for a whole month awaiting the arrival of the ships, which were to bring victuals, munition, and ordnance. In the meantime Carew sent for Sir Charles Wilmot, who was operating in Kerry with about 1,500 men, to join him—a movement which Tyrell and his men did their best to prevent, by occupying the passes south of Killarney. They kept him off for some time, but on the 12th of May he performed a remarkable feat, making a night march over Mangerton mountain, and then pushing on to Inchigeela. Carew joined hands with him at Cariganass on the 13th of May. Tyrell was forced to retire before superior force.
" A letter from the Lord President to the Spanish Cannoniers in Dunboy.
" When Don Juan de Aquila (General for the Spanish Armie in Ireland) departed from the Citie of Corke, having a care of your safeties, requested mee to favour you, saying that contrary to your willes the traytor Donnell O'Sullivan (by force) held you in his Castle of Dunboy, there to serve him as cannoniers, I now calling to mind his desire (in the love I beare him, being so great a captaine, and so honourable a person as he is), and in consideration of the promise I made him, doe write this letter unto you, promising (for the reasons before mentioned) that when I shall sit downe (with my forces) before the castle (where you are) if then you will quitt the same and come unto mee. I will by the faith of a gentleman and a Christian, make good my promise to Don Juan de Aquila, not onley to secure you in coming to mee, and in the like safetie to bee with mee, but also to relieve and supply your wants, and likewise at your pleasure, to accommodate you with a ship, and my passport, safely to passe into Spaine, in such manner as hath been already accomplished to the rest of the Spanyards that are returned to their countrey.
" This above written I am obliged by my promise to Don Juan to fulfill. But if you have a desire to finde or receive further favours at my hands, you may with facilitie deserve it, that is, when you leave the Castle to cloy the ordnance, or maybe their carriages, that when they shall have need of them,they may prove uselesse, for the which I will forthwith liberally recompense you answerable to the qualitie of your merit.
" Lastly, if there bee in your companies any strangers (English and Irish excepted), which are likewise by force held (as you are) these my letters shall be sufficient to secure their repaire to me, and also to depart, as hath beene before mentioned, condionally, that you and they present yourselves unto mee, before our ordnance shall begin to batter the Castle of Dunboy aforesaid. But if on your part default be made, I holde myselfe clearely acquitted of my promise made to Don Juan, and to be free from breach of faith on my part, and you ever after incapable of this favour of my promised offer. Returne me your answer by this bearer in writing, or by some other in whom you have more confidence." " From the Campe neere Bantrie, the Seventh of May, 1602.
" To the Spaniards held by force in the Castle of Dunboy." This letter, which is characteristic of Carew and his methods, produced no effect on the Spanish cannoniers, which proves that they were not detained by force. On the 31st of May the army left Carew Castle and marched towards Bantry, and encamped that night a little further on on the Carbery shore. A strong garrison was placed on Whiddy Island. On the 1st of June the Earl of Thomond and Sir Charles Wilmot's regiments were embarked for Beare Island; on the 2nd Sir Richard Percy's regiment followed; and lastly the Lord President. There was some difficulty in landing the pieces of battery on the island, but this was effected eventually underneath the church, probably where the present pier stands. On the 5th of June, Thomond, with the knowledge and consent of the Lord President, sought an interview with Macgeoghegan, the Constable of the Castle, and this took place on the western end of the island. He thought he might be able to corrupt the Constable by promises and bribes, but in this he failed. Macgeoghegan, who belonged to a once powerful sept in Westmeath, could not be corrupted. He advised Thomond not to hazard his life by attempting to land on the main, for " I know," said he, " that you must land on yonder Sandy bay, where before your coming the place will be so intrenched and gabioned that you must run upon assured death." On the 6th, being Sunday, a wild and rough morning, the President very early rode out, accompanied by one attendant. He went two or three miles to the west of the island, where he got a view of the Sandy bay, Caematrunane, the place where the Irish thought he would land. He saw that it was well fortified. He then got a pinnace and went across to Dinish Island. This island is separated from Sandy bay by a narrow sound. He examined the place carefully, and found it would suit his purposes. The middle of the island was high ground, and so he could land his army on the east end of it, or on the mainland, without being seen by the enemy. He also found near at hand a natural platform, whereon he might plant his cannons to protect his forces while landing. The President and the Earl of Thomond's regiments were then embarked, and were landed at Dinish Island. They were formed into a battalion, and ordered to face the enemy as if he intended to attack them, and thus force a landing at Caematrunane. Sir Richard Percy and Sir Charles Wilmot's regiments were likewise embarked, but they were landed on the main land under shelter of the island, and were landed before the Irish discovered the deception. The two first regiments then crossed in boats, while the Irish ran from Sandy bay to oppose them. They had to travel over a mile of rough country without a road, and had to cross a rapid river without a bridge, so when they came up all were landed. " Nevertheless," states the Pacata Hibernia, " they came on bravely, but our falcons made them halt." Twenty-eight of the Irish were slain and thirty wounded. There were two prisoners taken and presently hanged. Seven of the English were wounded. The army encamped that night about Castledermot, which was at the eastern end of the present Castletown. No trace of the castle remains, and the residence of Dr. Lyne occupies the place where it stood. On the 7th the army encamped within a mile of Dunboy. The President, taking with him Sir Charles Wilmot and a guard of 100 men, went out to reconnoitre the castle and surrounding ground. Contrary to the opinion of all, he found good ground for encamping, about 240 yards west of the castle, but out of sight of it by reason of high ground intervening. He also found, not 140 yards distant from the castle, a natural platform for planting his cannons. On the 8th two falcons were mounted near the camp, which played on those working about the Castle, but they did not hurt anyone, the range being too long. There was some difficulty in transporting the ordnance. It was decided to put the cannon into small boats which were to sail through a small creek called Faha Dhuv, and the entrance to this creek was commanded by the guns of the castle, but nearly a mile from it. Captain Slingsby volunteered to perform the task if he was provided with thirty musketeers. He placed those in the hold of the vessel, from which they kept up constant firing. Many shots were fired from the castle at them, but no one was hurt, probably because the guns failed to carry so far. On the 11th the English entrenched their camp and mounted their ordnance. On the 12th a contingent of 160 men, under Captain John Bostock, accompanied by Owen O'Sullivan and Lieutenant Downing, embarked in four boats for Dursey Island, and arrived there early the next morning. A landing was made on the north side of the island, where they found the walls of a ruined monastery constructed, Philip O'Sullivan says, by Bonaventura, a Spanish bishop, and long destroyed by pirates. A party of men under Lieutenant Downing were stationed there. Then the Captain got into a boat and rowed around the island, with the view of discovering a fit landing place. He decided to land the body of his men on the east of the island, and sent word to Lieutenant Downing that at the very instant the forces were landing he should deliver an attack on the north side of the fort held by the Irish. The fort was now attacked from three different points. The defence was stubborn at first, but after some time the outer work and three Spanish cannons were abandoned by the Irish. They fought in the inner fort for two hours, and then surrendered on condition that their lives were spared. They were all carried to the camp and executed. Five hundred milch cows were taken from the islanders. On the 13th Tyrell made a night attack on the English camp, but he was repulsed. On the 16th the trenches were finished, and three cannons were planted 140 yards from the castle. On the 17th, about five o'clock in the morning, the cannons, consisting of one demi-cannon, two whole culverins, and one demi-culverin, began to play on the castle. About nine o'clock in the forenoon a turret annexed to the castle on which an iron falcon was placed, and which kept up a constant fire on the English battery, tumbled down, many being killed by the falling masonry. The ordnance then played on the west front of the castle, which, by one o'clock, was forced down. Upon the fall thereof the Irish sent a messenger offering to surrender if their lives were spared, and allowed to depart with their arms. The President handed him over to the marshal, by whose orders he was presently executed. Carew would have saved the lives of many of his men if he had come to terms with the enemy, but the shedding of blood did not affect him. Now the Lord President thought everything ready for an assault, and he ordered his men to enter the castle. At this moment the great carnage commenced. The English rushed in through the breach. The besieged poured on them shot and stones, and ran them through with pikes and felled them with their swords, repelling gallantly the attack. The English thereupon drew their artillery nearer to the castle and made a greater breach. The Irish, who were only about 140 strong from the first, had now lost many of their men, and, owing to the wreckage that surrounded them, they were unable to use their arms with advantage, so the English rushed through the breach and into the great hall, where a bloody conflict ensued. The English lost many in this hall, and they had to quit it, leaving behind many dead. The English now brought fresh men to the attack, and the Irish were wearied, and wounded after long fighting. After a sharp contest they entered the breach, and seven companies carried their colours into the hall. Many fell on both sides, and there were heaps of dead bodies in the hall, on which ran streams of blood. Amongst the others, MacGeoghegan fell, half dead, covered with many wounds—not one of the Irish remained unwounded. At this stage some forty of the Irish made a sally out of the castle to the seaside, but they were surrounded by the enemy and put to death. Eight tried to save their lives by swimming, but Captain Harvey and Thomas Stafford kept guard over the sea and shot them down. Those of the Irish that were able, 77 in number, had now to betake themselves to the cellars, where the fight was continued with great vigour. Dominick Collins, formerly a cavalier in the French army, and now a Jesuit, rendered himself up, and was some time after carried to Youghal, his native town, in which he was executed. It was now sunset, and the English army withdrew to their camp, leaving a strong guard over those in the cellars. On the 18th, in the morning, twenty-three yielded, with two Spaniards and one Italian. Thomas Taylor, an Englishman's son, was appointed commander and relieved Richard MacGeoghegan, who was mortally wounded. The new commander drew into the vault of the castle nine barrels of powder, and, with a lighted match in his hand, threatened to blow up all near the castle if they did not obtain promise of life. He was eventually prevailed upon by his companions to render himself unconditionally. There were 48 more with him in the cellar, and when Sir George Thornton, Captain Harvey and Captain Power came into the cellar to receive their submission, Richard MacGeoghegan, perceiving that the Irish were about to surrender, " raised himself from the ground, caught a lighted candle, and staggered towards a barrel of powder," which he would have ignited had not Captain Power taken him in his arms, and he was instantly killed by some soldiers. Thus died the bravest of the brave ! The Pacata Hibernia states:—"The whole number of the ward consisted of 143 selected fighting men, being the best choice of all their forces, of which not one man escaped, but they were either slain, or executed, or buried in the ruins, and so obstinate and resolved a defence had not been seen within this kingdom." Those men were chiefly drawn from Westmeath and Connaught, and trained by Tyrell, a great commander. 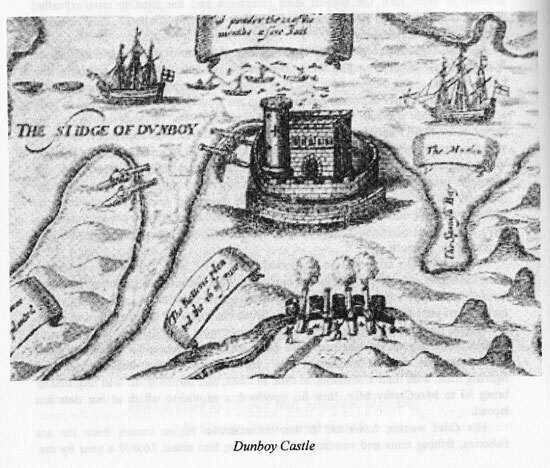 The English lost about 600 men at the siege of Dunboy. Carew had an army of 4,000 or 5,000 under his command, of whom scarcely 500 were English. was probably built in 1540 by Dermot O'Sullivan, a member of the O'Sullivan Beare sept (or clan), who wielded considerable power in West Cork during the 16th century and early 17th century. The castle passed through the hands of various members of the O'Sullivan clan during a period of internal feuding lasting until 1601, when the O'Sullivans united to support Hugh O'Neill at the Battle of Kinsale. Following the English victory at Kinsale, one of the commanders, Sir George Carew, pursued the O'Sullivan forces back to their base on the Beara Peninsula. A small garrison was left at Carriganass while the bulk of the O'Sullivan force returned to Dunboy Castle; Carew's army easily captured Carriganass before continuing on to lay siege to Dunboy. The O'Sullivans were subsequently dispossessed, and the castle later passed into the ownership of the Barretts, who retained it until the 1930s. During their tenure, a new house was built next to the castle, which deteriorated into its present ruinous state.